The new leaders of the U of A student media are, top row from left, Ashlyn Grace Brothers, Austin Cash and Beth Dedman; and bottom row, Morgan Lunsford, Chase Reavis and Mackenzie Reed. FAYETTEVILLE, Ark. 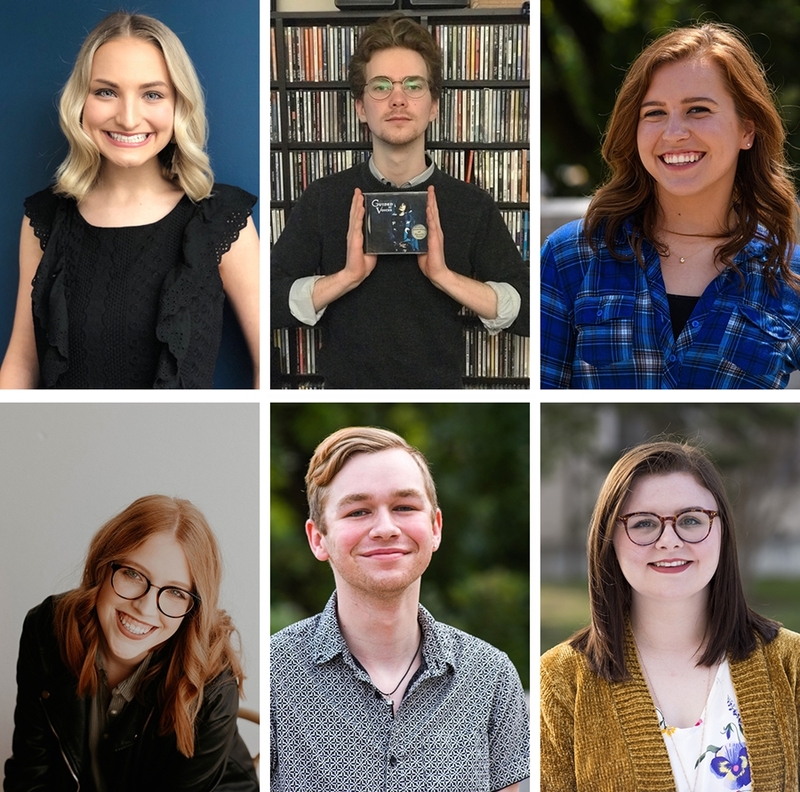 – Six University of Arkansas students were chosen as student media leaders to manage the student media outlets in the Office of Student Affairs for the upcoming year. Chase Reavis was selected as the new Arkansas Traveler editor. Reavis is a 20-year-old junior from Sapulpa, Oklahoma, majoring in journalism and Spanish. "Since my first semester at the University of Arkansas, I've been a part of student media. After college, I hope to work as a beat reporter and photographer, and I plan to use my Spanish degree to prioritize diversity and inclusion in my reporting," Reavis said. Chase will spend this summer as an intern with the Tulsa World. The new Hill Magazine editor is Beth Dedman. Dedman is 20 years old and from Fort Worth, Texas, majoring in English and journalism. "I have always been passionate about writing and discovered that journalism was a great avenue for expressing that passion. My time at the Arkansas Traveler showed me that I can turn my love for writing into a career and I look forward to my time at Hill Magazine so I can explore an entirely new facet of journalism that marries the creative writing side of my studies with the journalistic side," Dedman said. UATV's station manager is Ashlyn Grace Brothers. She is 20 years old and from Springdale, majoring in broadcast journalism. Brothers is actively involved in student media with current and past roles including UATV senior staff volunteer coordinator, anchor, sports anchor, world news anchor, meteorologist, Razorback Reels host and producer, Lemke Journalism Project mentor, and KXUA contributor. She has spent her spare time working and interning with multiple entities including KNWA/Fox 24, Sunday Night Football, ESPN-U, SEC Network, and HBO's True Detective, and she will spend this summer in Little Rock interning with KATV. Brothers is extremely excited to be UATV's next station manager, where she plans to continue the legacy of excellence while propelling the program to new heights. Austin Cash is the new KXUA station manager. He is 22 years old and from Bald Knob, majoring in art history. Cash looks forward to promoting local artists and carrying on the long-held college radio tradition of broadcasting independent and underground music on KXUA. The station's studios will also be making a move out of the Arkansas Union and into Kimpel Hall alongside the other student media during Cash's tenure. The new Razorback yearbook editor is Mackenzie Reed. Reed is from Wynne, majoring in biology and on a pre-medicine pathway. She first became interested in student media in high school and said she fell in love with yearbook's format of storytelling. She said, "It's an awesome experience that allows you to be directly involved with the history of the University of Arkansas, and I look forward to being able to 'tell' the story of the 2019-20 school year." The new Main Hill Media agency manager is 21-year-old Morgan Lunsford. Lunsford is from Frisco, Texas, and a small-business management major. She joined the Main Hill Media team because it seemed like a very practical way to get real-life sales and advertising experience, while also being a student. "I have learned so much about what it is like to work at an advertising agency and how to work on a team, and it has been so much fun," she said. The new Sue Walk Burnett Journalism and Student Media Center opened its doors last fall. The space features a state-of-the-art integrated newsroom where students from all journalism disciplines can converge and a new UATV television studio with an open view of one of the busiest hot spots on campus. All students on campus regardless of major may apply for positions to work on the student media. The new center is home to the university's student media programs, a part of the Division of Student Affairs, which include the Arkansas Traveler newspaper, UATV, KXUA 88.3-FM/National Public Radio, the Razorback Yearbook, The Hill Magazine, and the Main Hill Media student-run advertising agency.